When I starting my own brokerage, I made a promise to myself and the community to keep giving back & community involvement central in our day-to-day activities of helping clients. This value has brought us community partnerships, volunteer opportunities and a deeper knowledge of issues and topics that happen right in our community that many are not fully aware of. My agents and I hold a Quarterly Sea-Town Volunteer day that bring us the opportunity of gaining knowledge of our community and the issue impacting it, as well as an opportunity to make a difference. 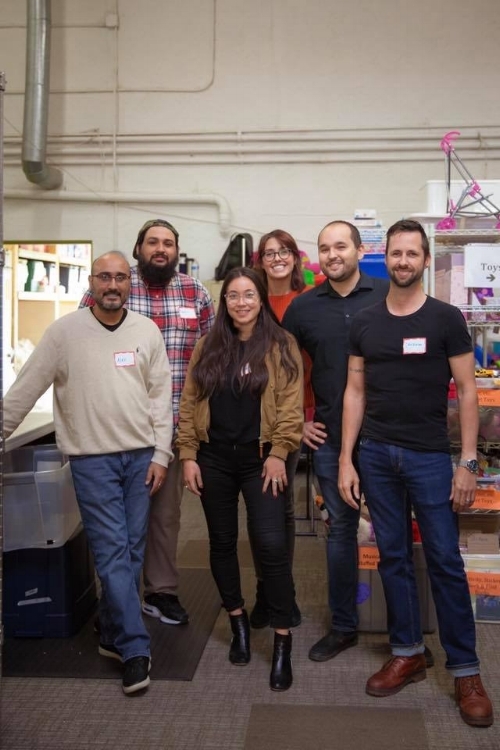 Our most recent volunteer day was with West Side Baby, who we have cultivated a partnership with and have collaborated together for previous volunteer events. WestSide Baby is a nonprofit organization that collects previously owned items for children and babies and distributes them free of charge to King County families in need. Their main mission is to keep children “Safe, Warm and Dry”. All of our volunteers from agents, friends and family came together and sorted out and organized children’s clothing while becoming more aware on how many families in the King County area are struggling to meet their basic needs. Our new insight from our volunteer day last month ties into this month’s cause of National Homeless Youth Awareness Month. When families are faced with the hardship of providing basic needs, it increases the chance of youth homelessness, which is a prevalent issue in Washington state and nation wide. Homelessness is a multifaceted topic and has increased significantly over the years in the Seattle area. Our monthly mixer coming up will be centered around this topic and we will be having the founder of Recovery Cafe, Killian Noe, speak at our event and educate us on homelessness and how we can make an impact on the Seattle community. If you are interested in joining us for any of our quarterly volunteer days or our Monthly Sea-Town Mixers, reply back to this email and we can include you on the invites. Additionally, while we are passionate about partnering with and helping the community… we are also passionate about helping our clients have an amazing experience with their real estate needs (we are an Indie Real Estate Brokerage after all & wouldn't be able to fund our giving without business sales). I bring this up because many of you have likely sensed or heard that the RE market has slowed down or is shifting in the Seattle market. The median house sale price has dropped by $90,000 in the last 5 months. It went from $830k in May to $740k in October. This doesn’t mean that the housing market is collapsing or even that it’s shifting because home values are still up 4% since this time last year (as oppose to 14%, which is closer to what they have been year-over-year, for the last few years). All this to say is that if you or someone you know wanted to buy a house but got burnt out on the process or was tired of getting out bid from multiple offers on the same property, NOW is a great time to take a look at what is available, since there are the most homes on the market now, then there has been over the last 5 years… meaning buyer’s have more options and leverage then they have over these last 5 years. REPLY TO THIS EMAIL OR GIVE ME A CALL IF YOU WANT TO KNOW MORE ABOUT THIS OR WHAT YOUR OPTIONS ARE AS A POTENTIAL HOME BUYER. Until next time, be well and be excellent to each other! The fact that you are still reading my newsletters means that I owe you a big thank you for being interested in hearing my unfiltered convictions and unconventional views on the real estate industry (yes the delivery has been inconsistency… we’ll do better ;-). In my past newsletters, I haven’t been shy (maybe a little too not shy) in exposing the reality of the industry, which got me fired from a brokerage for warning clients about unethical agents. I’ve also wrote about commiting to “be the change I want to see in the world” by building community giving and service into our business model, in part by donating 25% to local nonprofits. I also wrote about how all these things fueled my fire to create something more dynamic, transparent and honest when I launched my own Indie Brokerage in West Seattle at the beginning of 2017. In the newsletter linked above, I mentioned how I started off with just myself in a small office and as soon as I added my first agent and his assistant, I quickly realized I needed space grow, so I invested in a 1,400 square foot industrial office. In the last year, we have quadrupled our agent count (up to 12 agents now), we regularly host community events in and outside our office, continue to record the Sea-Town Podcast and continue my involvement on the board of the West Seattle Chamber, so I can learn how to best serve fellow local business owners. We do what we do because we want to see our agents, clients and community flourish and thrive ❤️! 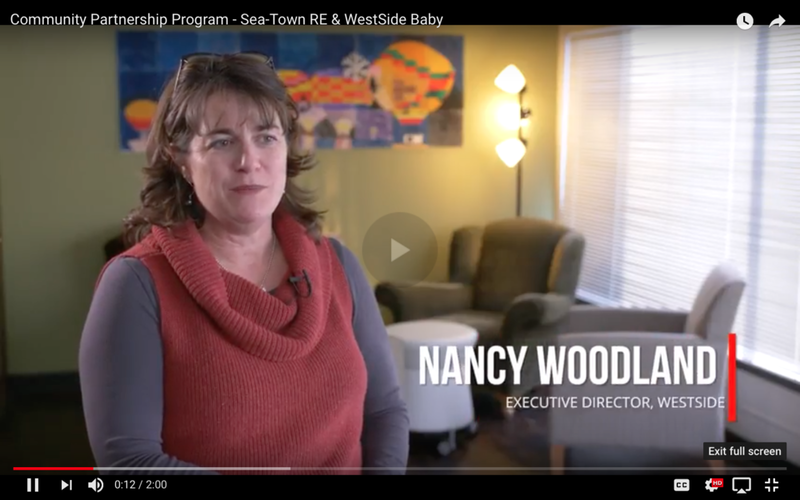 One of the things I’m most excited about is our Community Partnership Program that we launched earlier this year with WestSide Baby, where I interviewed Nancy Woodland, the executive director, on the podcast & created a video for them, telling their story a bit & highlighting the real issues they are helping tackle to provide essential baby items for low-income families. Announcing the launch of this giveback initiative at our Grand Opening got us a little press in a front page feature of the local newspaper, The WestSide Seattle (which was fun and unexpected). We also just had our first Sea-Town Monthly Mixer (Instagram post HERE) in September, which centered around the locally run non-profit, One Hundred for Haiti, where their founder and dynamic speaker, Greg Bennick joined us and educate us on the current situation in Haiti and how we can help. We had a great group of people from all different backgrounds, and unsurprisingly we had Malika and Meghan from West Seattle Vibes to come support, as always. Additional big thanks to Alair for their artistic work on our chalk board (they do great calligraphy work and you should totally visit them in West Seattle & follow them on Instagram) and to The Nook for hosting our event, providing great drinks and helping us raise money by donating a portion of the drink proceeds from the night to One Hundred for Haiti. 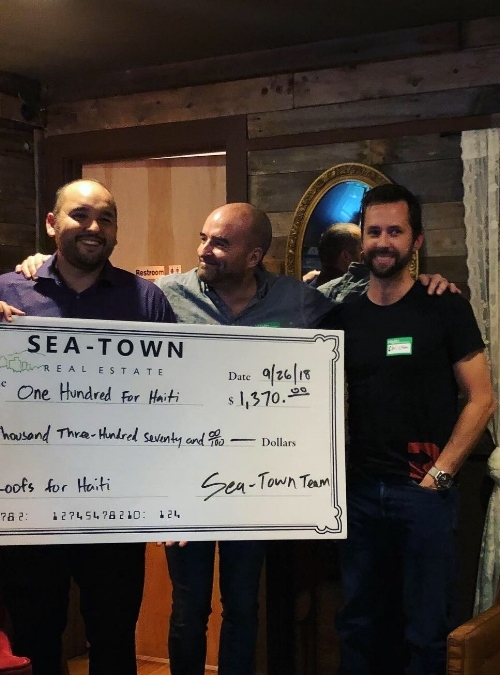 The highlight of the event (other then the free first drink) was being able to hear Greg speak about his story with Haiti and what exactly fueled his fire to start his non-profit organization and having the opportunity to hand over one of those fun oversized checks from funds raised and donated by Sea-Town Real Estate. When hearing about third world countries or anything that is foreign to us, many of us have the tendency to feel that it is out of our hands or there is nothing we can really do to help. The message that was conveyed so powerfully was that any contribution, large or small, makes an impact and creates progress, hope and a sense of community. Collaborating together we can collectively make a difference! At the mixer, it was really something special to have experienced that so many who participated were genuinely interested in giving back and curious in knowing how they could help. It showed that if you maintain your integrity and want to make a bigger impact, you can draw like minded individuals to yourself and your organization. I have seen this element in my brokerage from the agents I hire to our office culture and the type of clients that are drawn to work with us because they know that when they buy or sell a home with Sea-Town RE, they will not only get the best cutting edge experience but it will also help fund change in the community… and this is what makes it all worth while to me and keeps my hope alive that together we can make a difference and impact not just our community but also inspire and influence others in the real estate space, to also use their business as a vehicle to influence and make an impact for good. Reply back to this email and let me know what you've have been inspired to do in your life to give back and make a difference! Thanks for sharing in this journey with us.